Tenofovir alafenamide fumarate CAS number is 379270-38-9, it is a novel nucleotide reverse transcriptase inhibitor, rapidly converted to tenofovir after oral administration and is administered under the action of cell kinases Phosphorylation to tenofovir diphosphate inhibits both HIV and HBV activity by competitively binding natural deoxyribo-ribose substrates to inhibit viral polymerase and insertion into the viral DNA to cause termination of DNA strand elongation. Since tenofovir alafenamide has a lower solid state melting point and less solubility in water, which is detrimental to the preparation of Pharmaceutical preparations and the dissolution in pharmaceutical preparations,so tenofovir alafenamide has been developed as fumarateform for formulation. Many related documents disclose the fumarate salt form of tenofovir alafenamide and a process for its preparation by adding tenofovir alafenamide and fumaric acid to acetonitrile and heating to bring the solid Dissolved, hot filtered, cooled to 5 ℃and maintained for 16 hours, separated by filtration, and finally dried to give the product. Although these documents disclose the preparation of tenofovir alafenamide fumarate, none of its forms are disclosed. Studies have shown that tenofovir alafenamide fumarate CAS number 379270-38-9, prepared according to these published preparations can produce different crystalline forms when the content of tenofovir alafenamide varies. Because of tenofovir alafenamide fumarate has greatly improved in water-soluble, physical properties and so on than its free base form,it is necessary to further study its crystal form. In our study of tenofovir alafenamide fumarate crystals, we surprisingly discovered a number of new polymorphs of tenofovir alafenamide fumarate, with a pronounced powder X-ray diffraction pattern characteristics, and the preparation method is simple, excellent chemical stability, suitable for a variety of formulations. Tenofovir Alafenamide (GS-7340) CAS Number 379270-38-9 is a novel prodrug for tenofovir, mainly used for the treatment of HIV infection and hepatitis B virus infection, It is a renewed generation of tenofovir prodrugs than Tenofovir disoproxil fumarate. Clinical data shows that it is 10 times smaller than the dose of tenofovir disoproxil fumarate and has similar ability to clear the virus, and have higher safety and tolerance. At present, the four drugs for the treatment of AIDS included Tenofovir Alafenamide (GS-7340) CAS Number 379270-38-9 has been approved by the US FDA. In addition, the unilateral with Tenofovir Alafenamide (GS-7340) as the active ingredient of hepatitis B treatment drugs in 2016 was approved by the US FDA listed,so far it is considered to be the best treatment of hepatitis B drugs.. There are three main ideas about its synthesis, the first is use iethyl phosphite as raw material, after condensation and esterfication with paraformaldehyde to get the relevant intermediates and then by 6 steps to get the target product, this method is cumbersome, the Yield is not high. The second idea is using diphenyl phosphite as raw material, after condensation with chloromethyl benzyl ether, and then by hydrolysis, chlorination, condensation, separation, deprotection, esterification and get target products, this idea needs to use precious metal catalytic hydrogenationused to reach deprotection conditions ,it has high requirement on the equipment. The third idea is to directly with tenofovir as the starting material, first take heating reaction with the chlorination reagent to obtain PMPA-2CL, and then through the one-pot method and take reaction with phenol and L-alanine isopropyl ester to get the crude target product, due to tenofovir is very mature in market, the price is relatively low. We think use it as starting materia is more feasible. 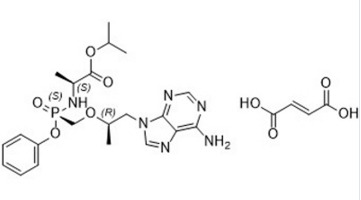 Tenofovir alafenamide, also known as TAF and GS-7340, is a nucleotide reverse transcriptase inhibitor (NRTIs) and a novel prodrug of tenofovir. By blocking reverse transcriptase, TAF prevent HIV from multiplying and can reduce the amount of HIV in the body. Tenofovir alafenamide is a prodrug, which means that it is an inactive drug. In the body, tenofovir alafenamide is converted to tenofovir diphosphate (TFV-DP). Tenofovir alafenamide fumarate was approved in November 2015 for treatment of HIV-1. Looking for ideal HIV Infection And Hepatitis B Virus Treatment 379270-38-9 Manufacturer & supplier ? We have a wide selection at great prices to help you get creative. All the GS-7340 Fumarate CAS 379270-38-9 are quality guaranteed. 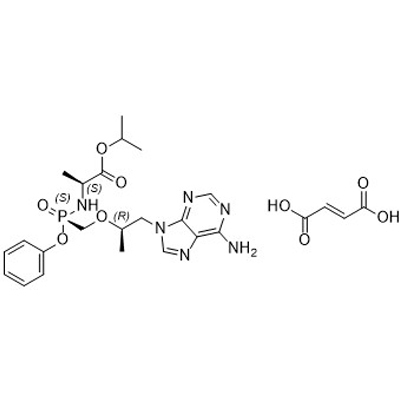 We are China Origin Factory of Nucleotide Reverse Transcriptase Inhibitor CAS 379270-38-9. If you have any question, please feel free to contact us.